Okay, try this with me: Bring up the memory of the hottest day in your life. Picture it: Where were you that day? What were you doing? Who was with you? How did you cope with the heat? The time was August 1988, a few weeks before the start of the academic year. 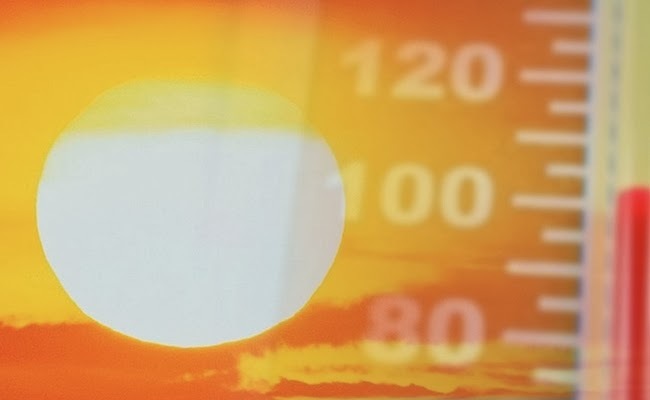 The Northeast was gripped by a ten-day heat wave. I went to Boston's Logan Airport, to meet my then-boyfriend, who had decided to come to the US to go back to school. He emerged from immigration and customs wearing a thin layer of perspiration. I could tell it wasn't my lovely presence that caused him to pant slightly. "It's so hot!" was almost the first thing he said. "Hot?" I said, "It's cool in here; this terminal has air-conditioning." "This is air-conditioned?" he yelped. I could see a trace of panic come into his eyes. I suspect that at that moment he considered turning around and taking the next plane back to the pleasant Dutch climate. My poor boyfriend nearly passed out when we came outside into the heat and humidity. He spent the following days stretched out in front of a fan (I had no air conditioning then, either), while I fed him salads, iced lemonade, ice creams, everything cool. Eventually, the heat wave passed. My boyfriend didn't turn back: he stayed, got his degree, and by and by became CelloDad. But it was a close call. Think back on that day, the hottest day in your life. Now imagine that a time when such days happen a few times a year. Then, a time when they happen pretty frequently. I know, right? It makes you break out in a sweat just thinking about it. But it's coming unless we stop pumping carbon dioxide and other greenhouse gases into out planet's atmosphere, and it's coming sooner than we might think. Climate change studies tend to depict scenarios around the year 2100: that's after my lifetime. I might not even see 2050. It's hard to wrap your head around dates that far into the future. But now a team led by Camilo Mora at the University of Hawaii at Manoa has put the data in a different light. It's eye-opening. 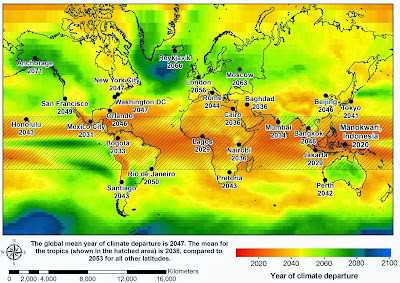 Starting from the well-established climate data and models, Mora's team have computed the Year of Climate Departure for locations throughout the world. A place has reached climate departure when the average temperature of its coolest year from then on is expected to be higher than the average temperature of its hottest year between 1960 and 2005. It is the year in which that place has truly reached the "new normal" and its "old normal" is history. Below is a world map with the year of climate departure indicated by colour, with a few cities highlighted. We've heard a lot about arctic sea ice melting, but this data shows that it is the tropical region which are first to reach climate departure, as early as 2020. This should worry us, because tropical species are much more vulnerable to changes in their environment than species in temperate zones. The group has posted an interactive map on which you can look up the Year of Climate Departure for your region. When looking at data like this, we need to allow for the fact that climate scientists, like all scientists, are a careful bunch. They don't make statements that are not built on strong evidence. This is why their reports tend to understate the risks we face from climate change. They certainly don't include runaway warming scenarios. In fact, climate scientist Michael Mann has described this paper as "an overly rosy scenario". Well I'll be. Because if you look at the Climate Departure years for biodiversity, the picture is grim enough. It's not just that we will sweat more: Our food chain might be in jeopardy within 25 years, or perhaps sooner. Before that food will merely get horrendously expensive. Species will migrate to milder climates. Well: it would be cool to have parrots and birds of paradise frequent our woods. But it won't work out that way: it's more likely that people in what are now temperate zones will be visited by scourges that are so far confined to tropical latitudes, like malaria, dengue fever, fast cockroaches and big spiders. Canada's population is now concentrated near its boundary with the US because its northern reaches are too cold. But soon the US population might collect on the Canadian border trying to get away from the heat. Heck, at some point Canada might build a wall on its border to keep Americans out. The map above is the "business as usual" scenario, where we keep burning fossil fuels and the CO2 content in the atmosphere has more than doubled to 936ppm by 2100. if we work very hard at limiting CO2 emissions, the outlook, though still serious, is not nearly as dire. "33 leading U.S. businesses -- including eBay, Nike and General Motors -- released a statement ... supporting strong U.S. climate policies. And nearly 700 more companies have signed on to the "Climate Declaration" in the past month, most notably Microsoft. " The cost of solar cells has dropped by 99% since 1977, which has caused a boom in the PV industry (see chart below). You know it's gone mainstream when IKEA starts selling solar panels. This must be the only place in the economy where I can be glad to see robust growth. It took all of us to get us to this point. It will take all of us to get us back to relative safety. Make no mistake about it: we will all have to give up something. But we can't just sit back and wait for it to resolve itself. It really is up to us. Join Citizens' Climate Lobby and pressure your elected representative to do the right thing. Doing the right thing is hard, and will not be popular: An article on The Hill's Energy & Environment blog says, "Imposing an explicit cost on carbon pollution is the best way to put countries on a path toward steep emissions cuts, according to new research by the OECD." Don't wait for our elected "leaders" to lead: find ways to slash your own carbon footprint. Drive less, bike and walk more. Get informed, but choose your sources of information carefully: many are willfully misleading. "There is a great civilisation drama unfolding that pits the force and power of science and reason against the arrayed influence and power of money and vested interests in sustaining a petroleum-based economy long beyond its useful life expectancy. We, the public, have a great stake in the outcome of this struggle, and must not be content to stand meekly on the sidelines while the gladiators do battle." 1. Natural Gas: Bridge Fuel or Dead End? Hottest day of my life was 3 years ago in May. I don't remember much of that day except that it was really hot. A few years ago in a Seattle apartment with poor air circulation, it was so hot at night that I took a 2-liter bottle of frozen water, wrapped in a towel, to rest on my belly as I tried to sleep. I can hardly imagine having to live that was all the time! This is one of those issues where our own personal interest coincides with our planetary duty. When we bought a house we installed photovoltaics and are planting trees (away from the PV) and feel proud and happy at the result! I've read that it is especially the nights that will be warmer. So great that you are part of the PV revolution! I hope your trees will give you much pleasure -and fruit. I'm not sure if it was the hottest but it was scary. Travelling through Spain on a bus (1998), 40 Celsius in the shade. We're in the middle of nowhere on a long stretch of highway and the bus pulls over. The driver comes in the back and says the bus is overheating and asks who has water to spare. After about 20 minutes we were luckily back on the road.